Where Everyone, Human and Animal, Matters! 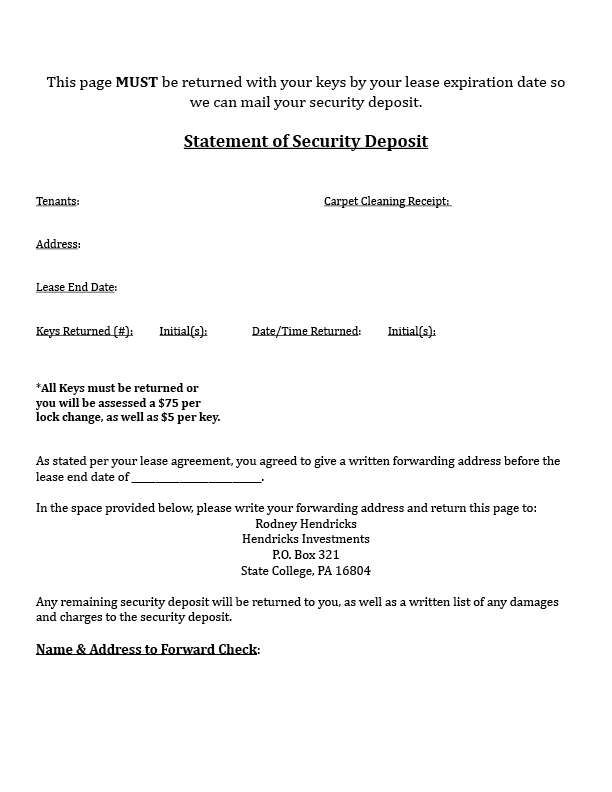 We strongly prefer the situation when all of the security deposit is returned. It saves us time, hassle, and, in the long run, money. 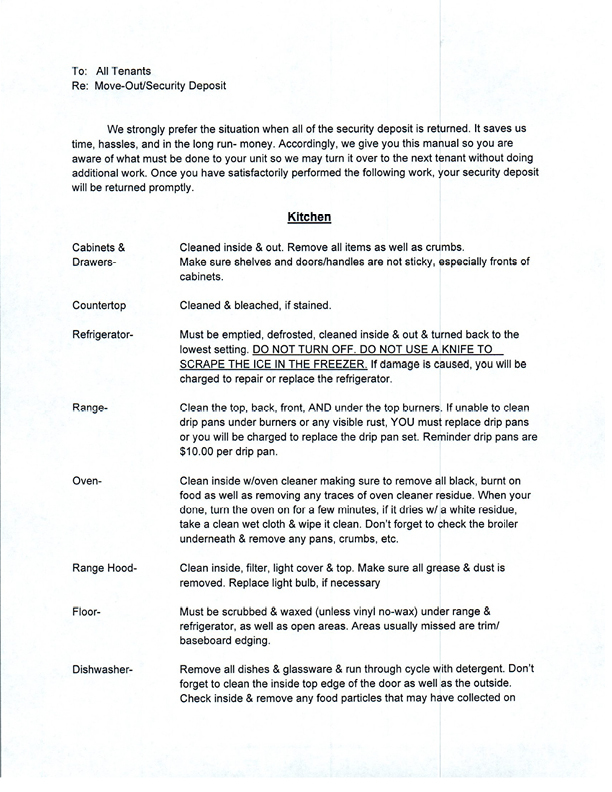 Accordingly, we give you this manual so you are aware of what must be done to your unit so we may turn it over to the next tenant without doing additional work. Once you have satisfactorily performed the following work, your security deposit will be returned promptly. Cleaned inside & out. Remove all items as well as crumbs. Make sure shelves and doors/handles are not sticky, especially fronts of cabinets. Cleaned & bleached, if stained. Must be emptied, defrosted, cleaned inside & out, & turned back to the lowest setting. DO NOT TURN OFF! DO NOT USE A KNIFE TO SCRAPE THE ICE IN THE FREEZER! If damage is caused, you will be charged to repair or replace the refrigerator. Clean the top, back, front, AND under the top burners. If unable to clean drip pans under burners or any visible rust, YOU must replace drip pans, or you will be charged to replace the drip pan set. Reminder drip pans are $10.00 per drip pan. Clean inside w/ oven cleaner making sure to remove all black, burnt on food as well as removing any traces of oven cleaner residue. When you're done, turn the oven on for a few mintues. If it dries w/ a white residue, take a clean wet cloth & wipe it clean. Don't forget to check the broiler underneath & remove any pans, crumbs, etc. Clean inside, filter, light cover, & top. Make sure all grease & dust is removed. Replace light bulb, if necessary. Must be scrubbed & waxed (unless vinyl no-wax) under range & refrigerator, as well as open areas. Areas usually missed are trim/baseboard edging. Remove all dishes & glassware & run through cycle w/ detergent. Don't forget to clean the inside to edge of the door as well as the outside. Check inside & remove any food particles that may have collected on the bottom. Must be fully charged. Otherwise, a non-reported discharged fire extinguisher is a $200 fine per extinguisher. Must be cleaned w/ no soap scum residue or hair left behind. Make sure there is no "ring around the tub." Must be removed & shower curtain rings must be disposed of. Cleaned inside & out, especially around base at floor. Make sure there's no "ring around the toilet" in the bowl. Must be cleaned w/ no scum or grease residue. Must be cleaned top & bottom. Make sure all toothpaste residue is removed. Wiped clean & toilet paper removed. Must be cleaned with no residue or hair left behind. Cleaned inside & out, ensuring there are no streaks left behind. Must be emptied & wiped out, also outside & top cleaned. Must be scrubbed & waxed (unless no-wax). Remember to get behind the toilet as well as along tub/shower. All glass must be cleaned w/ no streaks as well as the window tracks & windowsills. You will be charged if your windowsills have dust, bugs, or any debris on them. Shades should be taken down & washed then re-hung. Must be professionally cleaned by a cleaning service w/ a truck-mount. A carpet cleaning receipt must be turned in to the office or the carpets WILL be charged. Carpets must be vacuumed before they can be professionally cleaned. Please call the office for a list of preferred professional carpet cleaning companies. Must be washed & must be put back in windows. All items must be removed & carpets cleaned/floors waxed. Must be wiped clean, plates & all receptacles. Must be completely empty, swept, & scrubbed. Must be wiped off w/ wet cloth. Must be dusted & shining, if glass, & assembled. All the furniture that you rented must be in your unit. Otherwise, all furniture must be removed by 12pm on your lease expiration. Any furniture left behind will be removed from the premises & you will be charged at a rate of $45/per man hour to remove the furniture. Must be cleaned w/ no debris/ash left behind. In addition to any cleaning charges, the following items will be deducted from your security deposit if they are not paid before the end of your lease. 1) All light bulbs must be in lamps, sockets, etc. & be in working order. All smoke detectors must have batteries & be in working order. Fire extinguishers must be in working order & fully charged. If any of the items are missing or do not work properly, your security deposit will be billed accordingly. 2) ALL keys must be returned upon move-out. If keys are not returned, you will be charged the cost of changing the locks (approximately $75 per lock) & $5 per unreturned key PER LOCK. 3) Our office must have a forwarding address for you before you leave. The address may be mailed to Rodney Hendricks, PO Box 321, State College, PA 16804-321 or submitted with your final rental payments or keys. 4) You must call West Penn Power at 1-888-686-0021 & inform them of your lease termination date & make arrangements to have the final meter reading done. If your unit uses gas, you must call Columbia Gas at 1-888-460-4332 for final bills and meter readings as well. You MAY NOT have utilities taken out of your name until your EXACT LEASE EXPIRATION DATE or you will be charged a disconnect utility fee, per your lease agreement. 5) You must call the State College Borough Water Authority at 814-238-6766 & pay your final Water/Sewer bill before your lease expiration date. Failure to pay your final Water/Sewer bill will result in a penalty & the charge will be deducted from your security deposits. 6) You must call cable & telephone providers to disconnect your television & telephone services. 7) Carpets MUST BE professionally cleaned. Again, as per your lease agreement, we do not accept rented machines or Serivce Master. You must turn in a carpet cleaning receipt w/ your keys! It is the only proof to show your carpets were cleaned! No receipt means that we will have your carpets cleaned & the charge will be deducted from your security deposit! 8) Any questions concerning move out procedures can be addressed by calling 814-231-2628 or by mail at the PO Box address above or by email at duronittany@yahoo.com.